This week has seen my son read lots more during the week than he ever has in a week before. 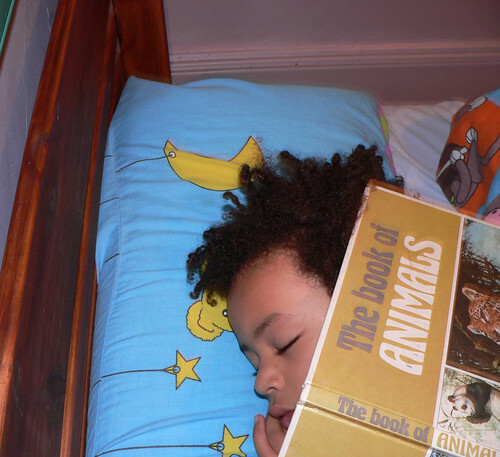 He’s been keen to read whenever he can and like his mum, wants to lie on his bed and read. I’m so glad that he’s discovered the joy of reading as it will open up his world. It sure opened up mine. My first reading love that I remember was Enid Blyton and I devoured her books. One day he might say to his children that his first love of reading were the Beast Quest books. He’ll even sit at the kitchen table and read some to me. The other night we got home from work and school and I was feeling quite down and tired so I laid on my bed and he read to me. I paid a bit of attention and corrected words that I could tell were quite wrong. I’m also trying to get him to spell words he doesn’t know out loud by saying the long sound, ie – ay be ce de ee ef, etc. He’s struggled a bit with this but is getting there now. I’ll try to broaden his diet of reading in addition to Beast Quest but as I’ve heard it’s better that he’s reading anything even if it’s just the one author. He’ll branch out one day just like I did from Enid Blyton although that took me a long time as she wrote heaps of books. I remember my friend’s daughter never used to like reading and Harry Potter got her going as I’m sure it has for many people. Actually I’m sure that in a couple of years JJ will love reading the Harry Potter books too. 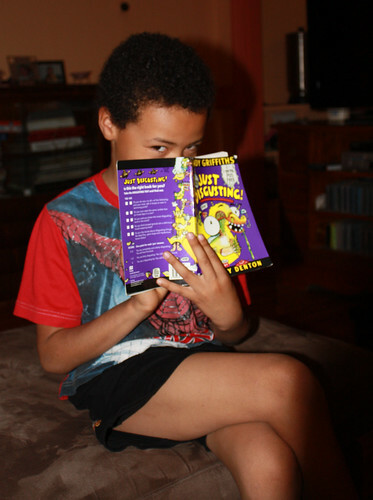 What do your kids enjoy reading and are/were they reluctant readers? He’s snuck off to his room – I bet he’s reading. This year JJ’s reading has gone from strength to strength. At the beginning of the year his reading pretty much consisted of picture books with basic words but now it’s the other way round. He’s also much better at giving words a try than he used to be. He used to see a word that he didn’t know and be too scared he’d get it wrong to even give it a go. With much persistence on my part I’ve managed to get him to at least try the word now and more often than not he either gets it right or he’s very close. I remember when I was a kid that I never used to say magician properly. It was always magican in my head. For his birthday in June a friend got him a couple of books, one of which is Just Disgusting by Andy Griffiths. Last night when I said I’d read him something before he went to bed this is the book he chose but then he read to me. He started reading the story about brussel sprouts, about how disgusting they are. I have to agree with that. I bought some brussel sprouts a month or two ago when they were in season thinking that maybe I’d grown out of my hatred for them but even though I didn’t overcook them, I still didn’t like the flavour. JJ wasn’t into them either so we won’t bother buying them again. After getting through most of the Andy Griffiths story about how he tries to offload his five brussel sprouts so he can get dessert, I don’t think JJ will eat them any time soon either. I may have said it here before but I’ve always loved books. As long as I can remember I loved to read. On family holidays mum was always commenting on how I had my nose stuck in a book and not much has changed. While I don’t buy that many books I am a regular at the local library. I really don’t know what I’d do if this wasn’t available. I’d probably be stealing just to keep my book habit going. At primary school we’d get the Scholastic catalogue and I was allowed to buy one, or two if mum was feeling really generous, books. They took what seemed like forever to arrive but when they did I would inhale the new book smell and I couldn’t wait to get home to stick my nose in my new book. We grew up in the country and didn’t have a local book store so whenever we visited the city we’d go into the book shop and I’d get my fix of the new book smell. Even now, going into a large bookshop brings back those memories of a little country kid walking around a book shop inhaling the new book smell and dreaming of what I could buy if I only had the money. I’ve kept pretty much all of my childhood books. When I moved from the country to the city my books outweighed my clothes and I’ve been moving those damn books ever since. I kept them for my kids, or when I thought I’d decided not to have my own, for my niece and nephews. One day – it must have been before JJ was born – my oldest niece and nephew were here and I invited them into my bedroom where my childhood book collection is kept and we went through them. They took a few and I wonder if they ever read them. Neither of them are great readers – not like I was anyway so I was a bit disappointed that they weren’t thrilled to have this vast supply of books on offer. I never opened up my collection to them again. Now that I have a son, he probably won’t like most of my books as they’re girly, so I’m not quite sure what to do with them. Perhaps I can sell some of them to a collector. I’ve been meaning for some time to share some of the books I’ve got and a recent post about MiscMum’s vintage young adult books inspired me to dust off the suitcases under my bed to see what gems I’ve got. I might make this a bit of an ongoing feature because I can’t do it justice in one hit. ‘Our Own Schoolgirls Annual’ was published in 1958 and was given to my aunt in 1965. I don’t remember her giving it to me but I’m sure I was very grateful. 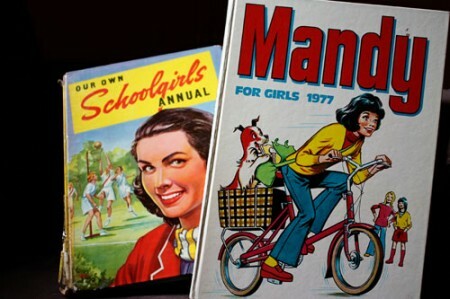 ‘Mandy for girls 1977’ doesn’t have any publishing information but because it has 1977 on the cover that must have been around when it was done. Even if I hadn’t mentioned dates it pretty obvious that the book above was published in the disco era of the 1970s. Other obvious differences, black and white versus colour. 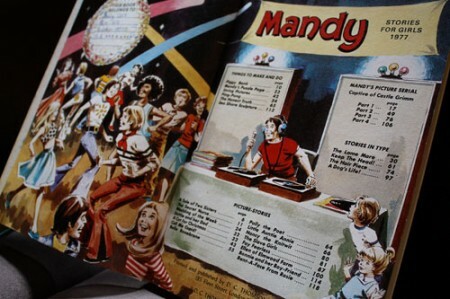 Mandy for Girls had activities contained within while the Girls Own Annual didn’t. 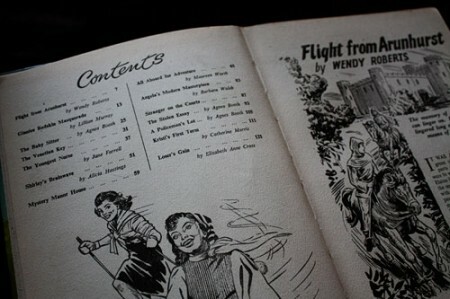 The stories in Mandy for Girls were all cartoons too and Girls Own Annual had some cartoons but the rest were mainly straight text with a few images here and there. I remember reading these books all the time which is probably why the spine is a bit worse for wear on Girls Own Annual. For your info I didn’t just have Girls annuals. Dad had kept some of his boys annuals as well which I was just as interested in. Unfortunately I don’t have them any more and have no memory of what happened to them. Do you remember girls or boys own annuals? Did you have any? I was delighted to witness a friend and colleague’s book launch the other night. It’s taken Siang a few years to get to this stage and I admire her dedication and drive in achieving this goal. When she’s not at work she’s inevitably at home writing and when you work full-time even just writing a book is a great effort. Well, she did have some time off to finish the book, but finish it she did and it was recently published by Harper Collins and launched the other night. 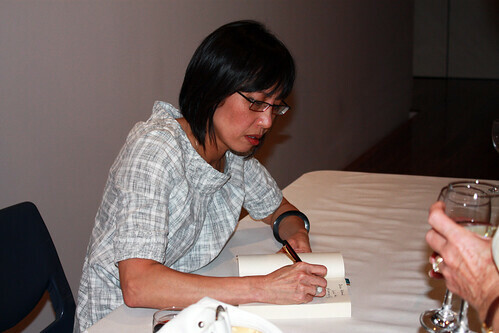 The book is called Handpicked, by Siew Siang Tay and the picture below is Siang signing someone’s copy at the launch. The launch was fun and it was a bit like a work reunion as Siang invited quite a few ex-colleagues so it was great chatting to them amongst the formalities of the evening. I have a copy of the book (signed by the author of course) but haven’t had a chance to read it yet. Buying fiction books for me is a luxury these days but I gladly bought a copy to support Siang. I also don’t read many books set in South Australia so I look forward to reading it for this aspect alone. She’s finishing off her second novel and already planning her third so hopefully there will be more book launches to come. Keep an eye out for her at the Sydney Writer’s Festival in May. Where oh where are the bloggers? Yesterday she got home after a night out and not wanting to do much else, turned on her modem and her laptop. She’s a bit of a statistics junkie and felt the draw of checking her blog stats to see if there had been any surge in visitors, or not. It was a resounding not. She thought that maybe the stats were wrong and there was a nought missing at the end. She did a bit of checking around and everything appeared to be normal. Her blog was up and there had been no downtime. It was a big disappointment especially as her stats had spiked to an all time high during the week. Even when checking her favourite blogs, there weren’t as many blog posts as normal. What’s happened she wondered? Where is everyone? Usually there were a lot more people providing her with a tale to read over a late breakfast on a Sunday morning. It wasn’t until this morning when she read this post over at Miscellaneous Adventures of an Australian Mum that she realised where those readers may have gone. Miscellaneous Mum’s denying her husband her husbandly rights but apart from this little post, she’s probably denying her blogging duties too. And so are a lot of others. As for the stat junkie, she hasn’t yet got her copy of the latest Harry Potter book. She’s keen to read it, but not so keen that she wanted to line up on a cold Saturday morning to get her copy. She’ll probably find out what happens before she reads it but that doesn’t bother her too much because the joy is in the reading of the story and if a major plot has been revealed beforehand, that’s not too bad. She would like to know if it’s really good and if it lives up to the others? In fact, she will probably have to read the others again just to get back into the Harry Potter groove. In the meantime, she’s still checking her stats to see if her readers have come back. PS: Speaking of groove, this was for day 7 of the blogging groove project. Once again I decided to join in the Patrick White Readers’ Group – this time for ‘The Solid Mandala‘. The other book this group has done was ‘The Vivisector’ which I waded through and you can read my thoughts here, here and here. I really liked the first chapter of ‘The Solid Mandala’ which is refreshingly short, unlike most of the remaining chapters in this book and most of the chapters in ‘The Vivisector’. I liked the way the protagonists, Arthur and Waldo Brown are introduced by Mrs Dun and Mrs Poulter as they are on the bus. White is very good a setting a scene and describing his characters so that we get to know the twins a bit before they make an appearance. Then I started on Chapter 2 about Waldo and got bogged down after a little while. As I kept reading I kept wondering what the heck was happening. There didn’t seem to be any point at all other than learning about what Waldo, his brother and their parents were like. We learn that Waldo is the smaller one and Arthur is the stronger, healthier twin but he likes to help his mum knead the dough. They don’t let their father know this though, as it’s not a manly thing to do. Then I got up to page 86 in my book and I haven’t continued. Ooh, I have loads of excuses which I won’t go into here but if you read the last week or two’s worth of entries in my blog you’ll get the idea. I feel a bit like I’ve failed, but I’m not losing any sleep over it. 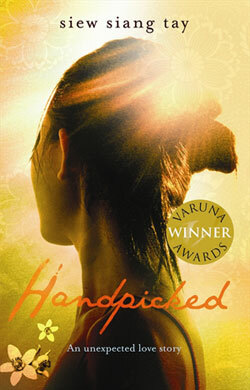 I did, however, watch the ABC’s First Tuesday Book Club last night to see what they said about it. It was interesting that the two older panellists, Jacki Weaver and Jason Stegar both liked the book. Jacki Weaver said it was her favourite one and she absolutely loves Patrick White. She said that you needed commitment and compassion to read it while Jason admitted it wasn’t an easy read, but he enjoyed it and he saw Patrick White in Waldo. The two younger guests, Craig Reucassel and Marieke Hardy both disliked the book a lot. Craig said that he found it difficult. It was dense and overwhelming and nothing happened. He said that no-one would understand the crucial moments but this is where Jacki liked it as she had to use her imagination for these bits. Marieke said reading it was like wading through a vat of cold porridge. I felt somewhat comforted after watching this that I am not alone in finding this book difficult. I don’t know if I’ll ever borrow it from the library again and try to read it, but when the Patrick White Readers’ Group comes up with the next book I’ll give it a go. I keep an eye out for the Blogging for Books competition each month, and usually check out TheZeroBoss weblog anyway, so when I saw the topic for this month’s entry I decided to use something I wrote last year. Normally I use it as an excuse for a writing exercise, but not this time. The topic this month is ‘Dream a little dream’ and mine is about dreams of course. Read for yourself. I’ve strayed away from my usual first person writing – something I do experiment with occasionally here.